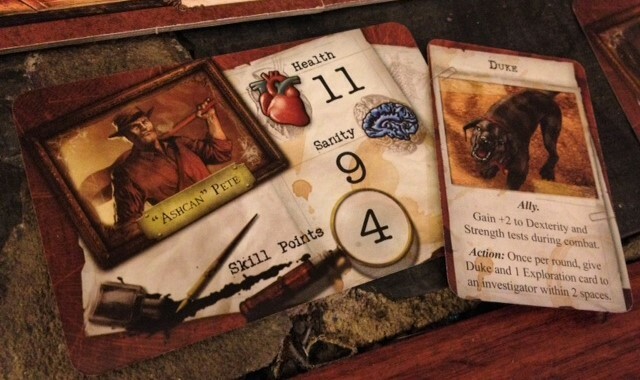 “Mansions of Madness” is a game for 2-5 players designed by Corey Konieczka with a ton of art by Christopher Burdett, Anders Finer, and Henning Ludvigsen. Although the story is not connected, the game exists in the same universe as other H.P. Lovecraft themed games by Fantasy Flight such as “Elder Sign” and “Arkham Horror” and even sports the same colorful cast of characters. Each game you play is like a miniature action movie where you are the hero. 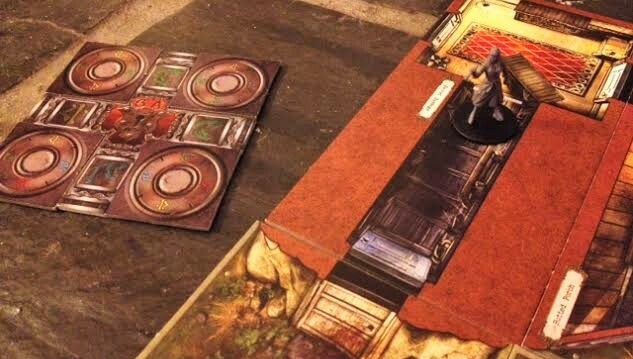 The game comes with a stack of beautifully illustrated rooms in a haunted mansion and a ton of neat figures representing player characters and monsters. What makes “Mansions” a special game is that the rooms can be arranged into five totally different buildings where five totally different story lines play out. In each you are given a series of clues hidden throughout the mansion which you must use to figure out what horrors live within and how to stop them. The twist? The monsters are being controlled by one of your friends, the “Keeper”, who already knows everything. Now, before we go any further I have to admit that this game is the Walter White of board games. It’s sadistic, complicated, and will probably lock you in a back room someday but for some reason you still like it. Simply setting up the game takes over an hour, and even after weeks of streamlining I can still only shorten it to thirty minutes on a good day. Plus, if you rush it and place a single card in the wrong spot the whole game can go pear-shaped. So tell your friends to go watch a movie and pray they don’t pick anything too distracting. Why? Because this tedious work must be done by the Keeper alone, since the other players can’t know where the clues are hidden. It sounds like a huge pain because it is a huge pain. However, if you are blessed with the organization of a wedding planner and the patience of a saint, the position of Keeper can be very rewarding as it allows you to guide the other players through the story. Having shouldered the burden of the clunky setup process you now get to feed your friends cryptic hints when they are stumped, throw zombies at them when they think they are safe, and taunt them with locked doors and puzzles which they must solve to get what they need to win. Did I say puzzles? Yes, yes I did. The game comes with six different types of honest-to-god brain teasers which are different every time you play them. Match the runes to escape! See, the strength of the Keeper system is that the actual players have no idea what is going to happen. The only mystery solving game I can think of is “Clue”, whose process-of-elimination dynamic means that the solution isn’t really a surprise; someone killed Mr. Body with a weapon in the house. But when you begin a game of “Mansions” you legitimately don’t know what’s up and that fills every game with a tense excitement followed by actual surprise. There’s just no other board game quite like it. This game has spawned looks of genuine shock from a people notorious for predicting the end of a movie in the first five minutes. I’ve had players jump from staircases, crawl through air ducts, and even play dead. On one memorable occasion a game ended with a deeply moving harmony of “Ave Maria” as we all died amid a horde maniacs with axes. It’s a tough game to love, but I say any game that can get a whole table singing is a game worth playing. Skip-a-Turn Variation: INSTANT REPLAY! : When players fight monsters the Keeper narrates a detailed slow motion scene of exactly how the attack happens. Gets especially fun when something invented for story purposes ends up making a difference later. This Post was posted in Board Game Reviews, Cthulhu Game, Role Playing Game and tagged Arkham Horror, board games, Fantasy Flight Games, Mansions of Madness, non-traditional board game, review, role-playing game. Bookmark the permalink. support because they aim to cease their medication and alcohol abuse. There have also been studies concluded on chronic MDMA users. Louis Because the area and substance abuse while in the Key Phrases research window.